Arnold Oliver Krueger, 86, passed away peacefully in his home in Paw Paw, Michigan on Saturday, April 21, 2018. Arnold, the son of William and Margaret (Wiles) Krueger, was born September 11, 1931 in Jamestown, North Dakota. Arnold's parents and nine siblings preceded his passing. Arnold served in combat as a Corporal in the Army during the Korean Conflict and upon his return married Jo-Ann Kingsnorth in August 1954. 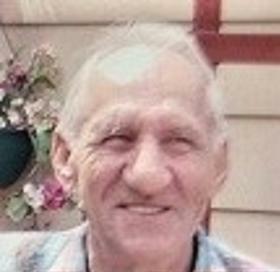 Arnold was a skilled machinist and carpenter until his retirement and a member of the Eagles and American Legion. Arnold is survived by his wife, Jo-Ann; four daughters, Desiree (Paul) Companion,Venice, FL, Diane (Lee) Thornburg, Allegan, MI, Debbie (Mike) Smith, North Port, FL and Dawn (Tony) Mendoza, Lawton, MI; nine grandchildren, Jessi, Angie, Britney, Tasha, Justin, Katie, James, Andrea, Austin, and eight great grandchildren, Alexis, Kolby, Cole, Gage, Marisa, Joseph, Audrey and Jordan, and many loved nephews, nieces and friends. A Celebration of Life will be held at the Paw Paw Eagles, 63237 M-40, Lawton, Michigan on Sunday, May 6, 2018 from noon to 2 PM. Contributions for family expenses are welcome. Please visit Arnold's personal web page at www.BetzlerFuneralHome.com, where you can archive a favorite memory or photo and sign his online guestbook. Arrangements by Betzler & Thompson Life Story Funeral Home, 60900 M-40, Paw Paw (269) 657-3870.